The design of a house for a family of three, organizes formal and informal spaces into two distinct structures. The smaller of the two serves as a formal entrance and parlor on the second level. Connected to it by a greenhouse covered bridge is the larger pavilion containing, on the same level, the informal living, dining and kitchen areas. The master bedroom is on the third level, while the ground floor serves as a guest apartment. 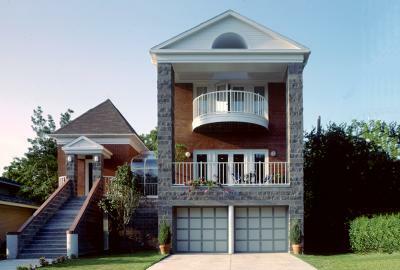 A series of decks and porches on the front and rear provides for a variety of exterior relationships.